Genuine OEM Sharp Toner Cartridge, Magenta, 10,000 page yield. Sharp part number: DX-C40NTM, DXC40NTM. Color Laser Toner Cartridge compatible with Sharp DX-C310, DX-C311, DX-C400, DX-C401. Genuine OEM Sharp Toner Cartridge, Cyan, 10,000 page yield. Sharp part number: DX-C40NTC, DXC40NTC. Color Laser Toner Cartridge compatible with Sharp DX-C310, DX-C311, DX-C400, DX-C401. Qualifies for free shipping & earn 98 points! Genuine OEM Sharp Toner Cartridge, Yellow, 10,000 page yield. Sharp part number: DX-C40NTY, DXC40NTY. Color Laser Toner Cartridge compatible with Sharp DX-C310, DX-C311, DX-C400, DX-C401. Genuine OEM Sharp Toner Cartridge, Black, 10,000 page yield. Sharp part number: DX-C40NTB, DXC40NTB. Laser Toner Cartridge compatible with Sharp DX-C310, DX-C311, DX-C400, DX-C401. Genuine OEM Sharp Drum Unit, Color, 30,000 page yield. 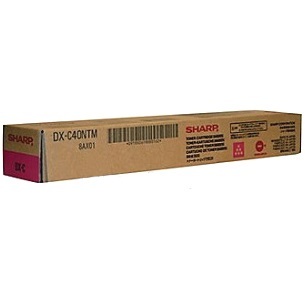 Sharp part number: MX-C40NRS, MXC40NRS. Drum Unit compatible with Sharp DX-C310, DX-C311, DX-C400, DX-C401, MX-C311, MX-C312, MX-C400P, MX-C401, MX-C402SC. Qualifies for free shipping & earn 84 points! Genuine OEM Sharp Drum Unit, Black, 60,000 page yield. Sharp part number: MX-C40NRB, MXC40NRB. Drum Unit compatible with Sharp DX-C310, DX-C311, DX-C400, DX-C401, MX-C311, MX-C312, MX-C400P, MX-C401, MX-C402SC. Qualifies for free shipping & earn 64 points! Genuine OEM Sharp 110V/120V Fuser, 120,000 page yield. Sharp part number: MX-C32FU1, MXC32FU1. 110V/120V Fuser compatible with Sharp DX-C310, DX-C311, DX-C400, DX-C401, MX-C311, MX-C400P, MX-C401, MX-C402SC. Qualifies for free shipping & earn 309 points!